Unfortunately, trash is an issue along almost every road in our state. However, the stretch of US Hwy 78 where it crosses Four Holes Swamp has lately been especially littered. The route leads to the nearby landfill and some debris blows free from commercial and private vehicles, but the majority of litter appears to be beverage containers intentionally launched from vehicles. 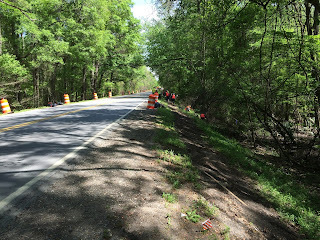 Additionally, the persistent high water, since the historic October 2015 rains, has rafted litter against the north side of the dam-like highway bed and into the woods on the south side of the highway. Eventually, water will carry litter downstream to the Edisto River and on into the Atlantic Ocean. Knowing that we would have ten enthusiastic University of Missouri students working for us during their alternative spring break, we planned to attack the US Hwy 78 litter issue sometime during their visit. However, we were not the only ones noting the excessive litter. 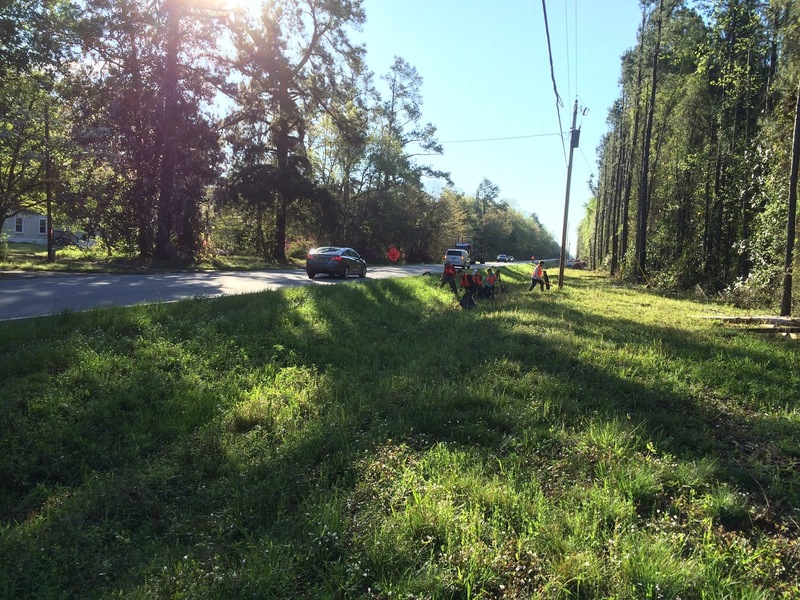 The folks at the Brosnan Forest, property of the Norfolk-Southern Railroad, regularly clean portions of US Hwy 78 where it passes through their property. They too had decided to address the problem at the Four Holes Swamp crossing. It was decided that we would combine forces and clean the mile-long stretch last Tuesday morning. With trash bags and litter grabbers provided by Carolyn Tomlinson of Keep Dorchester County Beautiful, the Francis Beidler Forest and Brosnan Forest teams met at the intersection of US Hwy 78/US Hwy 178. Each group divided into two teams with Brosnan Forest taking the north side of the highway and Beidler Forest/Mizzou taking the south side of the highway. One team from each group began on the west end at Bridge Lake, while the other team from each group was shuttled to the east side of the swamp near the Timothy Creek Riding Stables. Although the construction of the new bridge on the east side eliminated a portion of the area to be cleaned on the north side of the highway, the litter crews had the remainder of the roadway cleaned by noon. The 200+ bags of trash were piled along the highway shoulder for the South Carolina Department of Transportation to collect the following day. Not only did the crew from Brosnan Forest help us clean up a portion of the swamp, they treated everyone to a fantastic lunch at their facility near Dorchester, SC!